The declaration may be made by a mandatory bearer of a written power of attorney, even under private seal, of the father or the mother (Family Code, article 117). Penalty for late registration Yes; Late registrations require financial penalties and additional costs for obtaining a supplementary judgment (Family Code, article 114). Other official fees involved in the birth registration process Yes; Copies and extracts of acts of birth for administrative use require payment. In health facilities and hospitals, a birth certificate is issued after delivery for a fee that varies by health facility. For the registration, the presence and consent of one of the parents (father or mother) is sufficient. Registration can also be done by ascendants, close relatives or any person present at the birth. Another person designated as having a power of attorney in writing and signed by the parents may make the declaration of the child on behalf of the parents to the registry office. Process for establishing vital statistics on births Civil status data submitted to the Ministry of the Interior are collected and aggregated regularly for internal use. Ministry experts compile these data in working papers and make regular comparisons with international survey data, such as Demographic and Health Surveys (DHS) or Multiple Indicator Cluster Surveys (MICS). However, data and quality controls are performed only for internal use, without having major consequences on policy design and planning. In cases where internal population data vary considerably from international estimates or from survey data, little is done to understand these differences and their causes. In the virtual absence of official data on levels of mortality, plausibility tests on available data appear to focus mainly on birth rates and national population figures. Can the fee be increased or waived? Yes, ceremonial costs; Civil marriage or marriage in front of the registrar is an activity that takes place solemnly in a ceremony, which entails additional costs related to its organization. 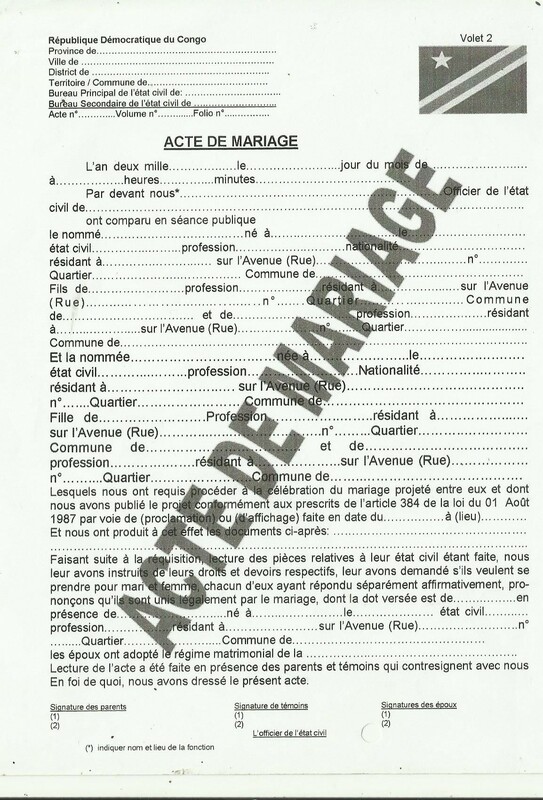 Requirements for marriage registration Husband’s presence at registration, Wife’s presence at registration, Proof of wife’s age, Proof of husband’s age, Witness to the marriage, Affidavit attested by magistrate, public notary, etc. Process for establishing vital statistics on marriage Civil status data submitted to the Ministry of the Interior are collected and aggregated regularly for internal use, but data and quality controls are performed only for internal use, without having major consequences on policy design and planning. In cases where internal population data vary considerably from international estimates or from survey data, little is done to understand these differences and their causes. Legal informant to register a death The death certificate shall be drawn up on the declaration of a relative of the deceased or of any person possessing the necessary information on the death (Family Code, article 133). 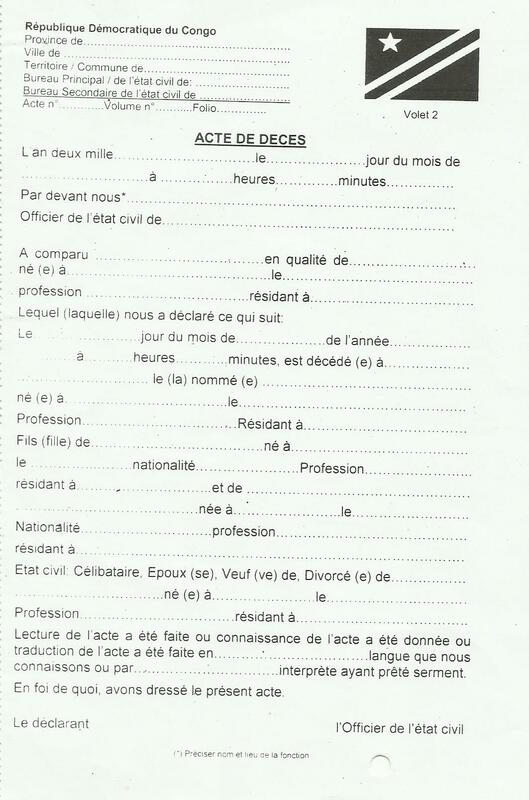 – Name, age, nationality, occupation and domicile or residence of the declarant. As far as possible, mention is made of the death in the margin of the deceased’s birth certificate. Process for establishing vital statistics on deaths Civil status data submitted to the Ministry of the Interior are collected and aggregated regularly for internal use, but data and quality controls are performed only for internal use, without having major consequences on policy design and planning. In cases where internal population data vary considerably from international estimates or from survey data, little is done to understand these differences and their causes.